There is almost no doubt that you have personally experienced what we call the “stethoscope woes” at some point or another in your medical career. You know- neck strain, pressure in earbuds, or some sort of general discomfort. You may have to find a good fit with some trial and error, but stethoscope holders can greatly reduce tension in the neck and also allow you to use your hands for more important tasks. Medelita’s Laennec Lab Coat was named after Rene Laennec, the inventor of the stethoscope. 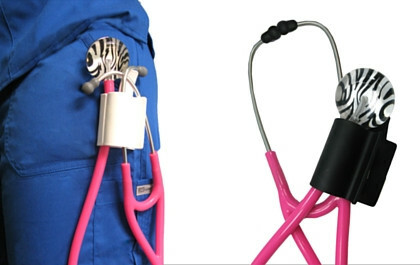 Stethoscope holders come in a variety of colors and slightly different shapes, which allows you to let a bit of personality shine through. A few brands even take this a step further with a name or logo personalization. Typically the holders attach to your waistband, and (fingers crossed) it stays there all day without falling out. The concept behind the holders is that by having a place to securely store your stethoscope, it is on your neck less and therefore reduces the neck strain. If you have not tried one yet, we recommend getting one to take just a little pressure off of your work day. This entry was posted in Trends In Medical Apparel and tagged Trends In Medical Apparel on April 15, 2016 by Ariel Jacoby.